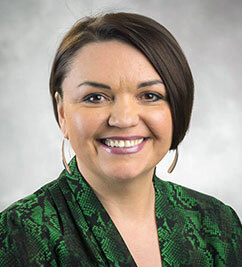 Ruslana Westerlund, Ed.D., received her Master’s in Teaching English as a Foreign Language from Bohdan Khmelnytskiy Cherkassy National University, Ukraine in 1995, and Doctorate in Education from Bethel University, St. Paul, Minnesota in 2014. She is now an associate researcher in WIDA’s Research and Development Division, Standards Department. Her responsibilities include re-conceptualization and development of tools for the English Language Development (ELD) Standards Framework. Her current interests include the intersection of Systemic Functional Linguistics and critical pedagogy in the education of culturally and linguistically minoritized students. Before coming to WCER, Ruslana worked as an ELD Specialist at K-12, teacher preparation programs at undergraduate and graduate levels and served as an ELD and refugee student specialist at the Minnesota Department of Education. In that role, she managed Title III, Title I as well as Office of Refugee Resettlement grants and collaborated with various state departments to provide wrap-around services to refugee children. In her spare time, she blogs at Reclaiming The Language For Social Justice blog. She is also an adjunct faculty member teaching courses in the ESL/bilingual licensure programs in several universities. She resides in Cross Plains, Wisconsin with a wonderful husband, two amazing boys, and two loving dogs.